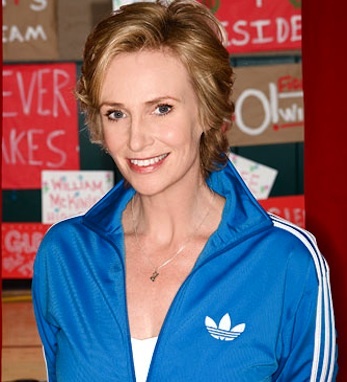 Jane Lynch is instantly recognizable as the Adidas tracksuit-clad, hilariously terrifying cheerleading coach Sue Sylvester, a role she has mastered to a T on Fox’s hit musical-dramedy Glee. As Sylvester, she slams unsuspecting high school students into lockers, gets her own face tattooed on her back and is hell-bent on the destruction of the Glee club. And she is wonderful. In 2010, she was awarded the Golden Globe for Best Supporting Actress in a Series, Miniseries, or Television Film. It’s an understatement to say that the recognition Lynch has received for her work on Glee is much deserved. The Chicago native has been acting for over 20 years and has more than 100 film and television credits, including three Christopher Guest films (Best in Show, A Mighty Wind and For Your Consideration), The 40 Year-Old Virgin, Julie & Julia, Two and a Half Men, and Party Down. Lynch was raised in an Irish Catholic family. After graduating from Illinois State University and from Cornell University with an MFA in theater, she went on to join Chicago’s prestigious Steppenwolf Theatre Company and the Second City comedy troupe. Last summer Lynch married her partner, Laura Embry, in a small ceremony in Massachusetts.